Upon arriving to the hotel Saturday morning, we were able to check in early, put our bags in our rooms and catch some of the morning workshops. I particularly enjoyed Ameenah Muhammad-Diggins workshop titled Juggling All Your Titles: Student, Wife, Mother and more. Her speech was so inspiring that I came home the next day and began working on writing my book. Ieasha Prime was also a joy to listen to both as a interviewer, speaker, and runway host! shop. I copped these cool glasses and Atiyya purchased our Black Muslim Women Matter shirt. As we caught up on each other's lives over the past few years, I took a break to bring out my silliness while trying on these beauties! We also enjoyed Ayana's insight on her time participating as a designer for Project Runway. It was a lesson on never taking no for an answer and she is to be admired for her work ethic. 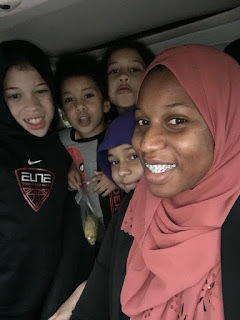 Of course, Ibtihaj Muhammad's interview with Ieasha Prime also served as a lesson to keep pushing when no one else believes in you. Overall, these workshops had a wide reaching appeal to children, teens, and adults alike. Next year I'll definitely go again and bring my girls. The highlight of the evening was the fashion show and Halima's talk with us about life in a refugee camp. Particularly, I enjoyed her nuanced look on why she sometimes feels uncomfortable taking on the title Black American. Halima shared that she understood that there was a different history there due to slavery and the subsequent fight for civil rights which is why I made sure in my question to let say the African Diaspora because at the end of the day, we're all connected by an ancestor! Checkout Halima's interview below as well as some of the pictures from the fashion show.